My GAS attack of a week or so ago has resolved into a number of exciting purchases. Whoohoo! Yesterday I ordered the Micro Spikes and the Inov8 Debris Gaiters, and also a couple of pairs of Bridgedale Coolmax liner socks. Today I’ve ordered 3 sheets of a product called Paraflexx, which I saw recommended by Andy Howell over on his blog in one of his enormously helpful and interesting posts about dehydrating. Paraflexx is a microporous sheet used for dehydrating “wet, moist or gooey” food which would otherwise drip through the holes in the dehydrator tray. I’ve used baking parchment and the cunning collapsible plates sold by Bob and Rose in the past to try to get round the drip problem, but TBH I’ve not found either of them to be an ideal solution. This Paraflexx is made for the job, and Andy says it works well, so I’m crossing my crubeens and planning some fruit and tomato leathers (thanks again, Andy!) to go with the scrummy meat and root vegetable stew currently simmering away on the stove downstairs. Now all I *definitely* need is a pair of Terrocs, but it’s looking as though I’m going to have to drive up to Kendal in order to be able to try them on, as I don’t know what size I need. The women’s Terroc 308 version may actually turn out to be too narrow for me–I have fairly wide lower crubeens–in which case I’ll go with the classic Terroc 330s. Hmmm… I’ve just remembered that I’ve not got the merino wool liner gloves yet, either. I can’t easily order them online because I often find that ‘small’ gloves are too large for me. Hopefully I can get some when I go up to the Lakes to buy the shoes. Kudos to The Outdoor Warehouse in Windermere, btw. I ordered the Micro Spikes and Debris Gaiters from them early yesterday afternoon, and they arrived with the postman this morning. Impressive! This entry was posted on Wednesday, May 5th, 2010 at 11:30 am and is filed under Dehydrating, Kit, TGO Challenge. You can follow any responses to this entry through the RSS 2.0 feed. You can leave a response, or trackback from your own site. 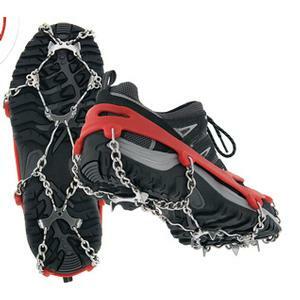 Used mine in the Cairngorms when conditions didn’t quite dictate crampons – they performed superbly. Even used them on the streets of London this year ! Heh, thank you 🙂 They seem like such a great idea! Jeez Louise! Just when we’d got most of yr recommendations from the fragrant Rose you come up with yet more! Philip Werner had hipped me to the Microspikes, and they certainly are tempting. But am currently hunting for a full-on Ectoplasm Mask – haunted bothies vs cornices – no contest . . .
Oops, sorry Bear! It was Piglet’s fault as she’d not read over my kit list until the other day.